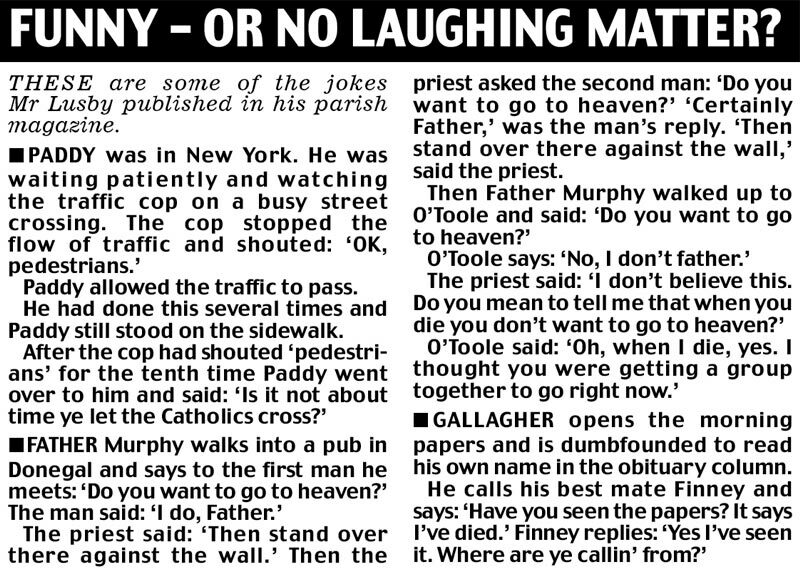 Heard the one about the Irish Catholic forced to quit for telling jokes ... about Irish Catholics! As an Ulster-born Catholic, Denis Lusby is perhaps more qualified than most to poke fun at the Irish. 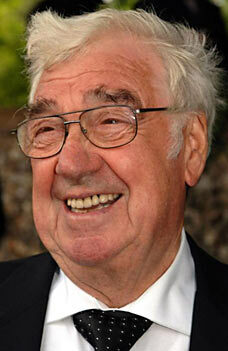 But although most enjoy reading the jokes he prints in his parish magazine, some can't see the funny side. And after a council official complained they were racist, Mr Lusby, the magazine's editor, resigned. The 58-year-old, who runs the village shop in St Breward, near Bodmin, Cornwall, has spent 11 years building up the magazine from a flysheet to a 56-page monthly. 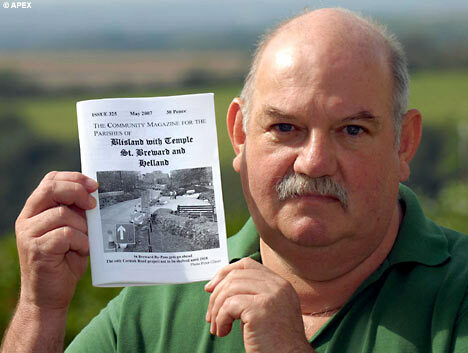 His 30p publication, which sells about 500 copies, includes information on local events. 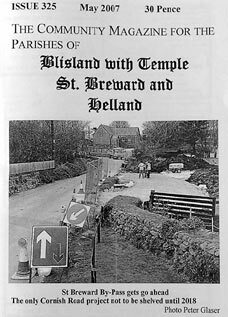 Schools in villages on the edge of Bodmin Moor also use the Blisland with Temple, Helland and St Breward Community Magazine to tell locals of their news. But after reading the May issue, Cornwall County Council's equality and diversity boss complained that the use of the names Murphy and Paddy in jokes in the magazine was racist and ridiculed the Irish traveller communities with whom she works. Ginny Harrison-White then wrote to schools asking whether it was appropriate to have their news printed alongside 'such derogatory material', claiming that the jokes may have an impact on the attitudes of the children. She called for headmasters to boycott the magazine. But Mr Lusby, a grandfather of four, was furious. He said: "I have spent my life being non-racist and anti-racist - and to have somebody accuse me of being racist is really hard to take. "IRA bombings were going on, so I reckon I know a lot more about racial prejudice than she does. "The magazine evolved out of the church notices and grew over the years but I've always put in the odd joke or two." Mr Lusby, who is chairman of St Breward's parish council, added: "It had all sorts of jokes, not just Irish, but in her letter this lady complained about the use of the names Murphy and Paddy, which is funny because Patrick is my middle name. "I feel she has used her position to put pressure on the schools. "The only time I have spoken to her was after we ran a joke about an Essex Earthquake appeal, which was full of Essex Girl jokes. "She rang up and said her neighbours came from Essex and was concerned they would be offended. "I told her that all humour is subjective. "I felt her letters to the school put the tin lid on it, so I am resigning." Mrs Harrison-White, who lives in the nearby village of Blisland, said that she sent the letters to the schools as a 'concerned local resident' rather than in her capacity as a council worker. "The context of the letter was to follow up an informal conversation," she said. "Because of my role I clearly come from an informed position with particular expertise and knowledge. "I firmly believe that it is the responsibility of all members of society to support each other to ensure that any actions, comments, or public materials do not cause offence." Her letter said: "There are three items which are distasteful and two of them use racist language or ridicule based on race as defined under the Race Relations (Amendment) Act 2000 and which may have an impact on the attitude and behaviour of the children and the wider school community. "I am asking if you feel it is appropriate for the school and church to have their articles, which demonstrate and promote respect and celebrate achievement, published alongside such derogatory material." Mr Lusby, originally from Londonderry, said the jokes weren't even his. "People sent them in for me to use." Whoever complains about jokes like the ones listed really needs to see a doctor and have the stick removed from their posterior. When we can't even laugh at ourselves anymore then we're taking ourselves WAY too seriously. The last time I checked, humility was still regarded as a virtue, but apparently not among many in the PC Police. I’m as Irish and as Catholic as they come and I think this stuff is funny.Geeze...some people are such dopes. Im as Irish and as Catholic as they come and I think this stuff is funny.Geeze...some people are such dopes. It must be a terribly unhappy life for Ginny Harrison-White, spending all of her days bound up in seeking out offended people, and if none exist, manufacturing them out of wholecloth. The most lowly, minimum-wage worker provides far more of a benefit to society than she does. I’m so stupid. I didn’t even know Irish Catholics were a race! Agreed.....completely tame and inoffensive.....unless you're specifically looking to be offended. Im so stupid. I didnt even know Irish Catholics were a race! Pope John Paul II loved Polish jokes. He thought they were hilarious. I’m sure he’d laugh out loud if he could see these (on the other hand, maybe he can!). I seem to recall hearing that as well, and it's been mirrored among a great many people I've met..... the ones with the kindest, warmest hearts have usually have the best sense of humor. Im sure hed laugh out loud if he could see these (on the other hand, maybe he can!). First this pathetic woman says she is not speaking in her official capacity, then she goes on at some length to say that because of her official capacity, she is in a position to know how harmful the jokes are. Sounds like a threat to me. By the way, I am mostly Irish and a Catholic, and I saw NO harm in those jokes. In fact, I loved the one about the priest telling people to go stand against the wall. Drat, wish I had a good Irish joke to add right here. A young Irishman sat at a pub in the New World drinking beer and conversin’ with the barkeep. Another comes in and sits besides him. He says how you do and hears the lilt and says you be Irish? Yes I am. The first man yells barkeep give us another round and one for my friend here he’s from the mother country as well. The second man asks-so where in the old country ye from. Dublin responds the first. Dublin you say - so am I and the second man hollers barkeep bring us another round and a shot of your best Irish Whiskey for me and my friend here. The phone behind the bar rings and the barkeep answers it. The owner of the pub asks - how is business. The barkeep responds - not too bad - The O’Malley twins are here getting drunk again.